These beautiful ballerinas are having a ballet lesson. It looks a bit pale in the dance studio though, and the ballerinas would like some colourful sparkly dresses to wear. 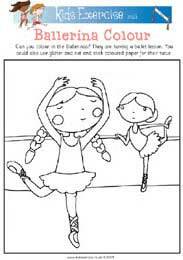 Can you colour in the ballerinas? You could also use glitter and cut and stick coloured paper for their tutus. Why not Download the Beautiful Ballerina Colouring Picture and see how pretty you can make it. This activity is aimed at 3 to 7 year olds, it's a fun way to raise your child's interest in exercise, as well as building their creative and recognition skills.